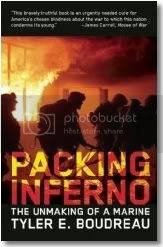 Packing Inferno is a thoughtful meditation on the warrior class, combat stress and where real hell lies, which as Boudreau will tell you, isn’t in the war theatre. The battleground is merely the foyer. The real hell is here and now, in the aftermath, daily, hour-by-hour, minute-by-minute, confronting the wounds -- physical and psychological -- that are the inevitable outcomes of war. In 2004, Boudreau served as a Marine corps captain in Iraq. Since then, his 12-years of active duty service and wartime lessons have inspired him to attempt to stir the nation's consciousness and conscience on war-related humanitarian subjects like the Iraqi refugee crisis. To get to know the man behind the Marine a bit better, let's look beyond the book via recently published pieces into Boudreau's efforts to do right by the people he was sent to liberate. Did you know that about 700,000 American children have had at least one parent deployed in the Middle East since our invasion of Afghanistan? Today, over 155,000 kids have a deployed parent overseas supporting our operations in Afghanistan and Iraq. While a resilient bunch, a lot of worry and strain are being carried on their little shoulders. Are they getting all the support they need? Back in May, I spoke at a "Healing the Hidden Wounds" summit organized by National Public Television and NAMI-TN. Among the stream of amazing speakers drawn together that day was a 24-year military wife and mom (and active professional social worker with Ft. Campbell's Family Readiness Group and the Centerstone Community Mental Health Centers). Military kids are desperately in need of resources and supports. Their needs appear to be among the most overlooked of all aspects of of our nation's protracted wartime stance. 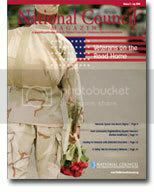 While Military Family Life Consultants, Military OneSource and MilitaryHOMEFRONT are wonderful resources, more are needed. Military children are acting out and need more peer group programs. Some are stealing prescription drugs from parents, coping with abandonment issues and angry that their deployed parents have missed so many important days (like graduation, etc.) over the years. These are signs that more substantial peer group programs are needed to help cushion their experience. Parents can't do it all. Parents are also under stress and need more child care tools. Left behind on their own -- as strong and capable as they are -- they are starved for supports and tools to help their kids to cope with the many emotions they feel before, during and after deployment. 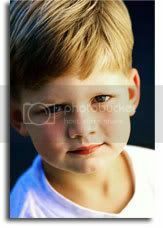 Parents need more adolescent care help, and parenting help, and activities that will bring kids together and foster ways for them to be able to talk their feelings and anger and worries out with each other. New data from a public health registry that tracks the health effects of 9/11 suggest that as many as 70,000 people may have developed post-traumatic stress disorder as a result of the terrorist attacks. Johannemann often said he might have been killed on 9/11 had he not stopped to get a cup of coffee just before the plane hit. Otherwise, he might have been on an elevator when a jet crashed and flaming fuel poured down the shaft. Instead, he was waiting for an elevator when he heard a huge bang and the doors burst open. A man tumbled out on fire and Johannemann helped him to an ambulance. "He was burned up bad but he was still alive," Johannemann told People magazine. In the aftermath, Johannemann appeared on the "Jenny Jones Show" and received the letter from the White House. Privately, the hero became a reclusive alcoholic. "He just started backing away and not bothering with anyone," Joseph Maya recalled. He avoided family, even on the holidays he had always loved. He seemed convinced he was friendless and alone. Eleven days ago, on August 31, he committed suicide. For those of you who've been along with me on my personal journey these past seven years, you'll probably remember that I was a former 15-year flight attendant with American Airlines the day two of our airplanes were used in the terrorist attacks on our country. In years past, I've written and shared photo essays on my experience of the events and my journey to Ground Zero three weeks after the attacks to pay my respects (my entire 911 collection of pictures is now on Flickr as well). While I personally was far removed from any danger that day, my life -- or, more directly, my career trajectory -- was directly affected by the day's unraveling. In fact, my advocacy for our returning veterans today can be traced back to the events of September 11, 2001. I was one of the lucky stews. 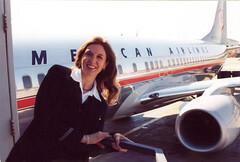 Senior enough not to be among the 7,000 flight attendants at our airline suffering forced lay offs that fall, I also had a great husband (an AA Captain at the time; now a first officer due to their own division's sizable layoffs) who supported my choice to take the early retirement packages being offered to us. It turned out to be a prescient move. Far too often the needs of our military families are still not being fully met by the overwhelmed traditional healthcare systems they rely on for their care. As a result, over the past few years, local organizations have sprung up all across the country, offering tailor-made support services and reintegration programs. The trend is covered in full scope and detail in the current issue of National Council Magazine. Filled with first-person accounts, case studies, the latest PTSD data and much more, the National Council for Community Behavioral Healthcare's current quarterly issue is a rich resource...it's also available online as a free PDF download. This Tuesday, I'll be taking part in a veterans' issues town hall meeting hosted by the Park Ridge VFW #3579 ("Illinois' Friendliest VFW Post") and State Senator Dan Kotowski. Kotowski has been a great champion of area veterans, his leadership bringing together the Northwest Suburban Veterans Advisory Council, the Illinois Department of Veterans Affairs, the federal VA, private health care and local community members in common cause. These groups are now all working together to provide this area with a Military Support System and model PTSD diagnosis and treatment program administered by The Vet Center at Alexian Brothers Medical Center. It's an exceptional resource for the community. The Center's new Veterans Imaging Program [VIP] is using state-of-the-art brain imaging or mapping technology – more powerful than a standard CAT scan – called MEG to detect the neurobiological signs of PTSD. MEG promises to quickly and accurately spot these brain changes found in PTSD patients in a completely non-invasive way. And this same technology can be used to help detect traumatic brain injury. We'll be talking about both PTSD and TBI tomorrow night, and I invite you to join us if you're in the area.